She’s a feisty counselor of troubled teens. He’s the fire department psychologist who’s trying to outrun his demons. They clash at every turn. Until one New Year’s Eve encounter changes everything. PTSD plagues Dr. Reed Macauley and he tries to channel the disorder into helping other firefighters with the malady. He keeps the nightmares at bay by distancing himself from his colleagues. But when, in a moment of weakness, he surrenders to Dr. Delaney Shaw’s allure, he finds he can’t put that particular genie back in the bottle. Delaney has fought her attraction to Reed for a year, ever since she met him at workshops and they clashed on philosophies. When he acts on his feelings for her, she won’t let him go. She can help him, she knows she can. Tragedy in the Rockford Fire Department throws them together as they must work side-by-side to help the victims cope. She won’t give up on him, and he won’t give in to her. Will they ever be able to find happiness together? 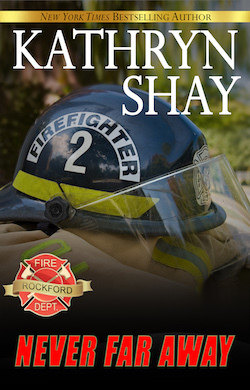 The horrific consequences of PTSD, edgy firefighting scenarios, and an irresistible intimacy of the main characters haunt the pages of this bittersweet firefighter romance.